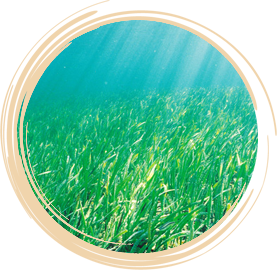 Seagrasses are a marine flowering plant that can live underwater. Unlike algae, they are true flowering plants (Phylum: Magnoliophyta) with leaves, roots, flowers, seeds and underground horizontal stems called rhizomes. Seagrasses support highly productive and diverse ecosystems. These specialised marine plants are vitally important in the coastal environment because they are a source of food and shelter; oxygenate water, trap sand and recycle nutrients; and provide breeding habitats and nursery areas for many marine organisms.